Several years ago I worked as a bather at a very busy dog grooming salon. I spent my days literally covered in fur, bubbles, slobbery wet kisses and – let’s be honest – a few scratches along the way. In my experience, most dogs didn’t love the prospect of a warm bath. Many would tolerate it, but most would do their best to resist. However, with a little bit of time and a lot of practice on my own sweet pup, Rory, I have come up with a few simple tips and tricks to help any dog learn to love bathtime. 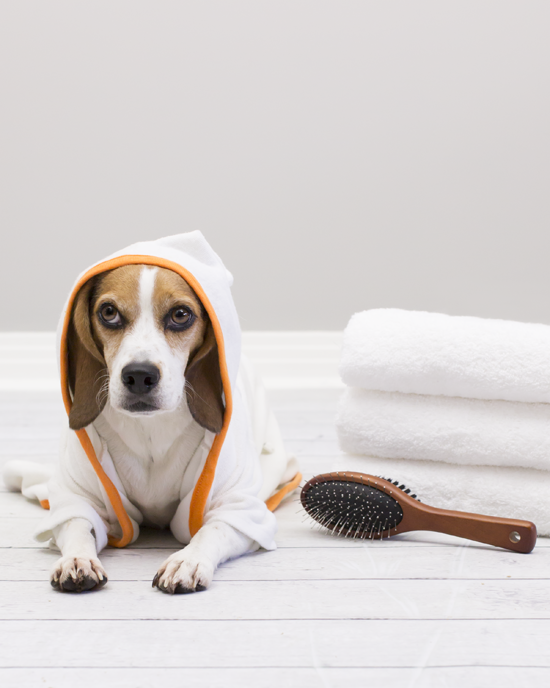 Regular bathing for dogs is important to keep their coats and skin clean and healthy, plus as an added bonus, it helps them smell nice. Here are a six secret tips to make bathtime a fun time! Imagine if you were at the hairdresser’s and your stylist kept running out of the room to grab the right pair of scissors or the right kind of gel. You would probably be a little peeved, yes? The same is true for dogs. 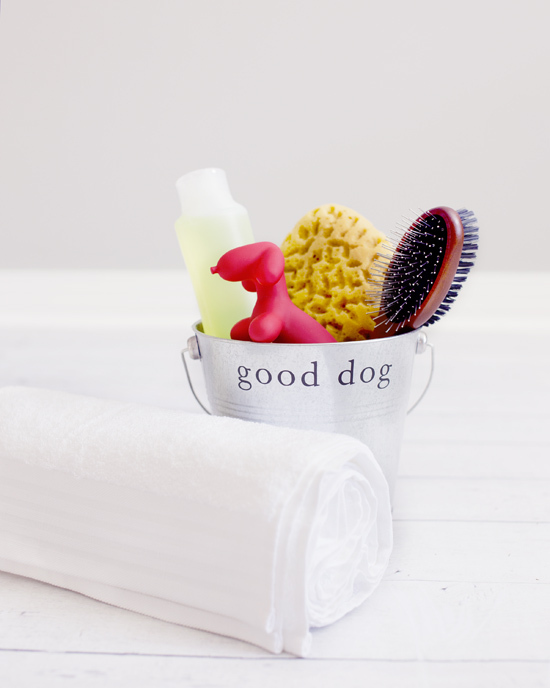 Make sure you have all of your necessary shampoos, towels, brushes and supplies set up by the tub or washing area so that you don’t get frazzled trying to manage a soggy dog while looking for what you need. Plus, being prepared in this manner will ultimately mean the bathtime will be short and sweet, which most pups will appreciate. Instead run a bath without your pup present. Test the water to make sure it’s just the right temperature and once everything is ready then bring your pup in. Introducing your dog to a still, calm pool of water will be far less stressful. Once your pup is in the tub, avoid using a handheld showerhead to wet and rinse them (unless they are indifferent to that). I use a large, empty yogurt container as a bucket to wet Rory down and rinse her off. I find scooping water up and over her to be a more calming action than blasting her with a nozzle. The dog is thereby calmer too. Most dogs detest the water element of a bath, so take some time to teach them what a fun wet thing water can be! Fill a tub with a little bit of water, enough so that it reaches halfway up their legs and encourage them to get into the water on their own. 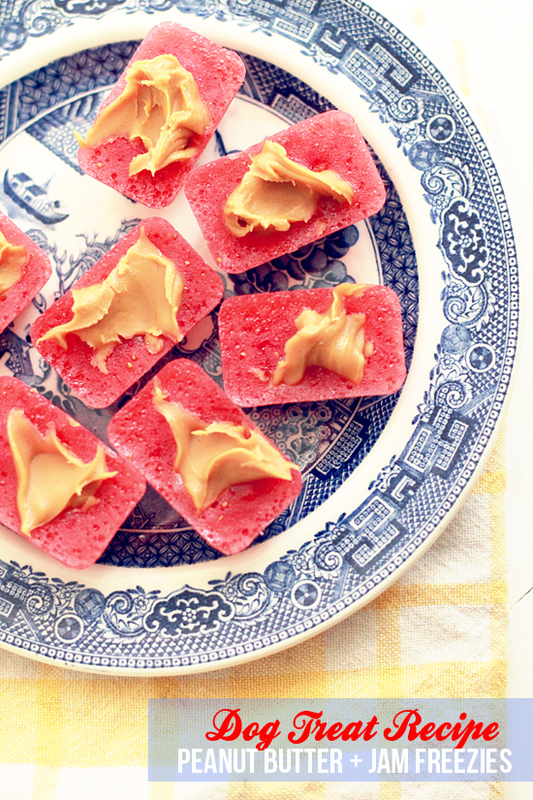 Treats can be used to entice the first plunge. 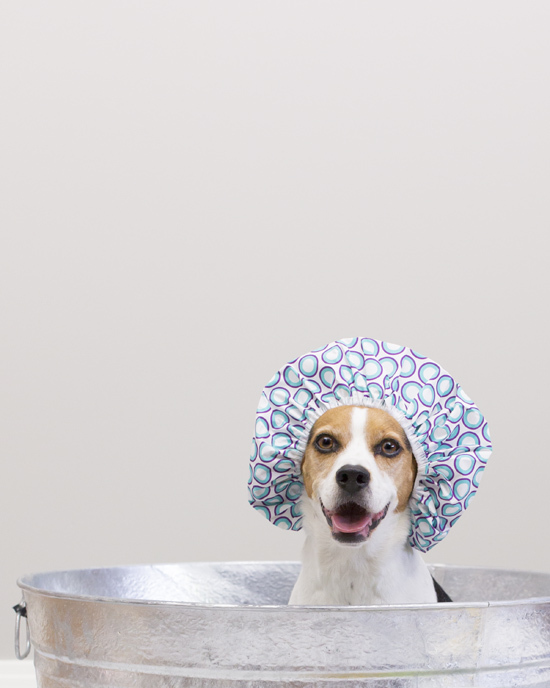 When your dog gets into the tub, let them hop back out again on their own time — slowly so they don’t hurt themselves. This is important so that they don’t feel trapped in an overwhelming environment. Be sure to use lots of praise when they get in and out of the tub so that they know you are proud of them and that the tub is a happy place to be. I find playing a gentle ‘splash’ game helps to engage dogs with water. Simply pat at the water’s surface or drop a toy that sinks into the tub and encourage your dog to also splash around. Just be sure to keep this game steady and calm. You don’t want a hyper dog in the tub, as they can slip and get injured. (Even better, use a non-slip bathmat in the tub for added safety). If you tend to bath your dog outside with a hose, spend some time playing with the water nozzle and your pup. Play ‘chase the water line’ in the grass and spray other people as well as the dogs. Believe it or not, this will help a dog feel safe with the hose and associate it with positive, happy energy. Repeat ‘water time’ as frequently as you can for 10 minute intervals to teach your pup that time in the tub is simply extra play time. Score! Remember when you were little and your parents had to bribe you into agreeing to bathtime with a special rubber ducky or toy boat? Well, this same trick can work for dogs too. I recommend having two designated bathtime dog toys — one that sinks and one that floats. Make sure that your dog only gets these toys when they are in the tub, ideally only when they get into the tub on their own. Toys are a great distraction while you’re lathering up the shampoo and rinsing the suds away. With your dog’s mind fixated on nosing around their floaty toy, they will be less likely to acknowledge the actual soaping up process. (This is the bathtime dog toy I use). Allow them to play with the toy for an hour after bathtime so that the toy is a reward for good bathtime behaviour. Then put it away ready for the next mucky occasion. 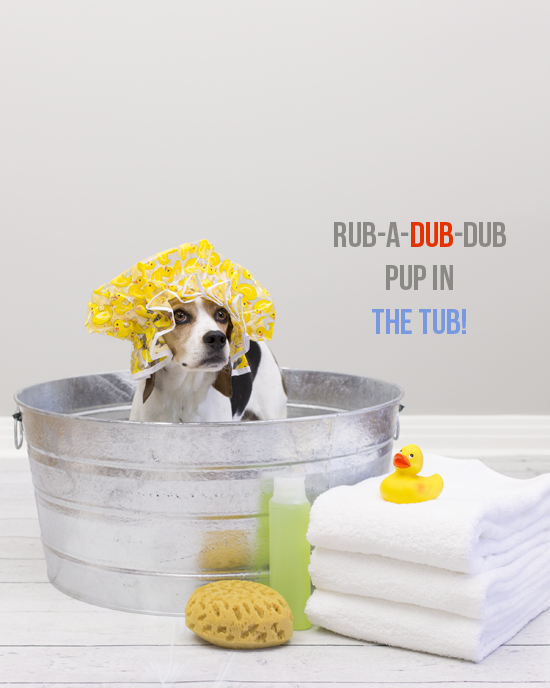 While Fido wriggling all over the place during his bath may be enough of a nuisance to make you want to scream, keep your voice light, happy and soothing. As with any situation, the more stressed out you become, the more stressed out your pupster will be. Use the same vocal cues you use when playing a game with your dog; you’re happy, energetic, yet firm when the play gets a little too rough. Your dog will know how to respond to this sort of verbal direction, rather than getting scared or upset by yelling. Contrary to popular belief, bathtime is not over when the last little paw comes out of the water. When you towel dry your dog, remember to maintain the fun game-like mentality. Most dogs get what is known as the ‘heebie-jeebies’ after a bath and will tear around the house in a super hyper manner (here is Rory doing just that after her bath this weekend). Embrace this happy mood with your dog and settle in for a game of light rough-house with the towel. 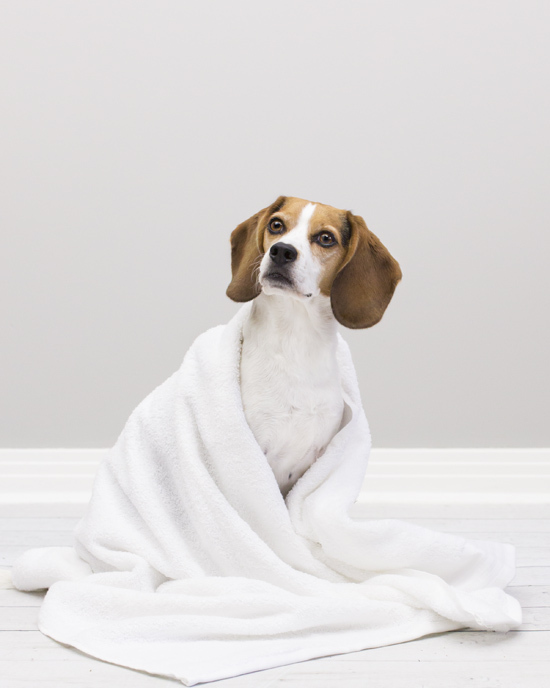 This may seem like peculiar advice, but by making the drying part of a bath into a game every time your pup comes out of the tub, they will remember the routine and look forward to the chance to go ‘crazy’ after being washed. This also reinforces the bath as a bonding ritual between dog and human. 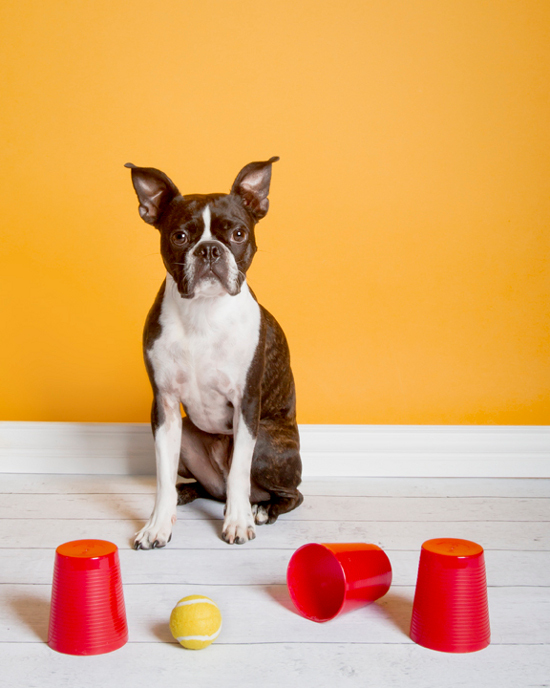 As any seasoned dog parent knows, canine kiddies thrive on routine. They do best when they know what to expect. 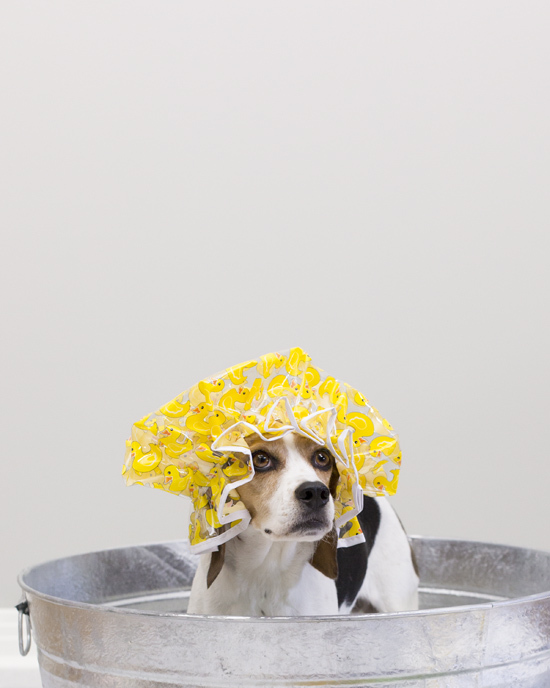 So no matter what your dog’s bathtime looks like, whether its in the family bathtub, the laundry room tub or with the backyard hose, make it a ritual with these tips. And above all keep it fun so that your dog looks forward to the treats, the toys, the afterbath antics and the extra time with you! It’s official. Yoga has gone to the dogs – quite literally! A new exercise trend stretching across North America, called doga (that’s right, yoga for dogs), is encouraging people to bring along their canine pals when they hit the studio for some downward dog relaxation. The practice is believed to have originated in Manhattan about 7 years ago, with the intent of nurturing the bond between dog and owner. As well, doga is meant to help keep bodies – human and furry alike – lean and limber, while maintaining positive mental energies. What else happens during a typical doga class? After a ten minute bouncy meet and greet where dogs are allowed to mingle with their classmates, soothing music oozes from a boom-box, everyone gathers in a circle on mats, and class begins with breathing exercises. Of course, dogs are not expected to perform all or any of the classic yoga moves, but instead enjoy a bit of massage and simple gentle stretches. “Dogs instinctively do ‘upward’ and ‘downward dog’ yoga positions when they wake up,” reveals Solomon. 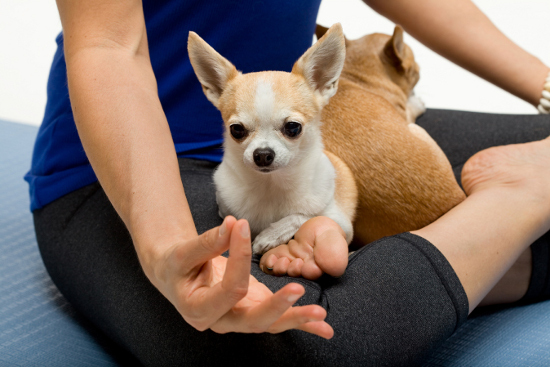 “So in class we try to encourage that natural behaviour, because it feels good for them and is good for them.” For the most part, however, dogs are used as props by owners during more intense yoga moves and are encouraged to lie by their masters’ side, or curl up in laps as class progresses. “Dogs can sense and feel your energy,” insists Solomon. “They take on the energy of the owner, so we focus on calm movements and breathing to get the dogs to chill out.” Thus, an opportunity for owner and pet to bond through some intimate one-on-one time is created. As doga grows in popularity, however, so too does the voice of criticism, raising concerns about the hybrid activity being just another example of half-hearted multitasking in our fast paced digital age, and that it is single ‘paw-ed-ly’ reducing the ancient practice of yoga to just a new trendy craze. “Sometimes it’s hard to fit everything in with a busy schedule,” admits Solomon. “But people love their pets and you still want to have that bonding time with your dog.” Combining yoga and time with your pooch is not so different then going for a walk or jog together, it’s just a quieter experience. “At a dog park there are constantly people coming and going, so a dog is always on alert and doesn’t have a moment to relax,” Solomon says. Doga is all about achieving true relaxation and having a real uninterrupted connection with your dog. Some may say that the idea is similar to the notion of mothers toting along new babies to a yoga class, except there is a lot more fur involved. There is a little bit of yoga practiced, and a lot of holding what you love close. “With pets it’s unconditional love they give,” says Solomon fondly. “In class I suggest thinking about how you are in your relationship with an animal and how to carry that feeling into your life, so you can have that affect on other people.” For Solomon and her two chihuahuas, Chloe and Cubbie, doga has become a way of life, a way to stay connected and a way to teach others about the importance of taking some time – a 45 minute class to be precise – to just breathe, stretch and cuddle. 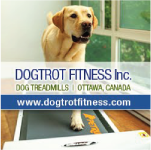 Although presently unavailable in Canada, doga is becoming increasingly popular within the United States and expected to dig its claws into Canadian workouts in the very near future.